Sciblogs | Are deer the new moa: Ecosystem re-wilding or a flight of fancy? Are deer the new moa: Ecosystem re-wilding or a flight of fancy? It’s the depths of winter and I’m squatting in the snow, surrounded by southern beech forest, using a pair of tweezers to pick up fresh steaming deer poo. 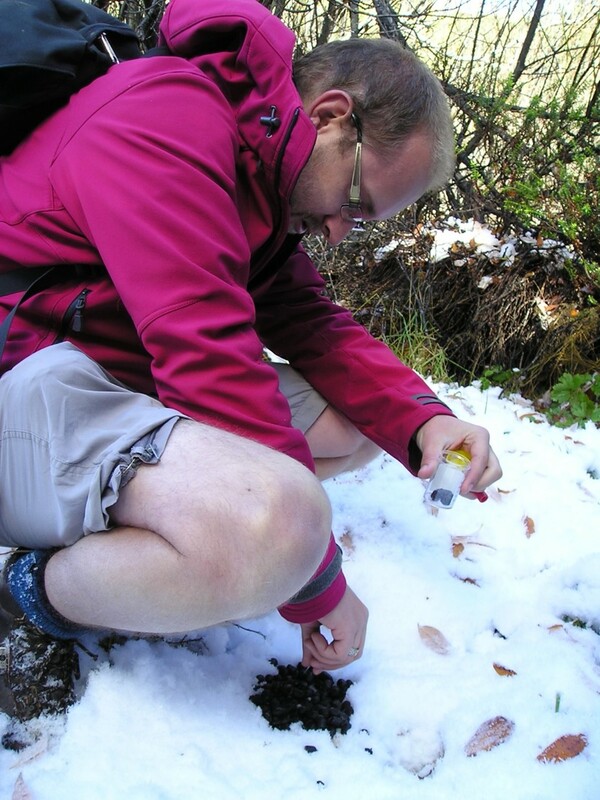 Pooper scooper: Braving the cold in the name of science, these deer droppings are a harbinger of a changing world. Photo courtesy of Jamie Wood. My wife Maria, and palaeoecologist Jamie Wood, from Landcare Research, are doubled over in laughter, having just given me the official job title of pooper scooper. We’re helping Jamie collect deer poo as part of a project investigating whether introduced deer fill the same job vacancy as the extinct moa in what remains of our unique ecosystems – an ecological surrogate to re-wild New Zealand. This long-running and often vitriolic debate has become closely associated with the anti-1080 movement. Hunters have illegally re-introduced deer into national parks and other protected conservation areas, sometimes where they had previously been eradicated. An uproar ensues whenever a potential deer cull is floated by DOC. So how did this feathers to fur debate start and can the latest Time Lord science help shed some light on it? In the late 19th and early 20th Century conservationists became increasingly concerned about the damage deer were doing to our indigenous forests. Visit any forest with deer in it, and the understory that would have greeted time travellers to prehistoric New Zealand, is now almost non-existent. Deer have eaten to death what they liked most. What little remains they either don’t like or can’t eat. Hunters, worried that their favourite animal was going to be controlled or eradicated by the burgeoning conservation movement, came up with an overly simplistic theory to justify the release of more deer and continued hunting; that deer were ecological surrogates of moa. Their argument was that moa, as the dominant herbivore in the pre-human ecosystem, had a pronounced impact on our unique plants. With the extinction of moa, forests were left unchecked, poised and ready to take over Aotearoa, like a scene from Day of the Triffids, or an army of ents. Rather than a pest, the argument is that deer are just filling the same ecosystem function as moa, keeping the botanical forces at bay. Why then eradicate them, hunters would say? Deer simply replaced moa and everything is fine. Nothing to see here, so the argument goes. More recently, the debate has reared its head again with some scientists advocating for introduced species to be embraced as part of a new hybrid post-apocalyptic ecosystem. Om nom nom: Moa were one of the dominant herbivores in Aotearoa’s prehistoric ecosystem. Photo courtesy of New Zealand Birds Online and Te Papa. For re-wilding to be effective, an ecological surrogate needs to be a closely-related species. Even that is fraught with danger, as our work on the poūwa showed. This extinct mega-swan spent more time on the ground, had elongated legs, reduced wings, and was built like a rugby player. In contrast, its close cousin, the Australian black swan, spends more time on the water and is built like a lithe soccer player – not a good ecological surrogate by any means. But deer are nothing like moa, I hear you say. This is the equivalent of saying that if I can’t find a nice single malt scotch, rather than settling for an Irish whisky, I’ll have a beer instead. The only similarity is that scotch and beer are alcohol, just as the only similarity between deer and moa is that they are both herbivores. In all this debate, hunters, and their supporters, have forgotten one key thing that all self-respecting scientists know: the past is the key to the present. Aotearoa is blessed with an exceptionally well-preserved recent fossil record. This includes the skeletal ghosts of moa, allowing scientists to look at how and what they ate, but also their preserved poo, called coprolites. These Rosetta stones have revolutionised our knowledge of moa diet and what role they played in the prehistoric ecosystem. So what do them bones tell us? We once had nine species of moa, ranging in size from dwarfs, one metre high, to true giants. Despite their size, their weight was dispersed through large feet and widely splayed toes. Deer, on the other hand, walk around on small hooves that cut and trample the forest floor into something resembling a rugby field after a particularly brutal match. The growth rings in some moa leg bones, much the same as those on a tree, indicate moa lived life in the slow lane, compared to the more boom-bust deer in the fast lane, which eat themselves out of house and home. With only around 1-2 moa/km2, competition for resources was reduced, compared to at least an order of magnitude higher numbers of deer (~ 10-20/km2), crammed into what’s left of Aotearoa’s indigenous forest. 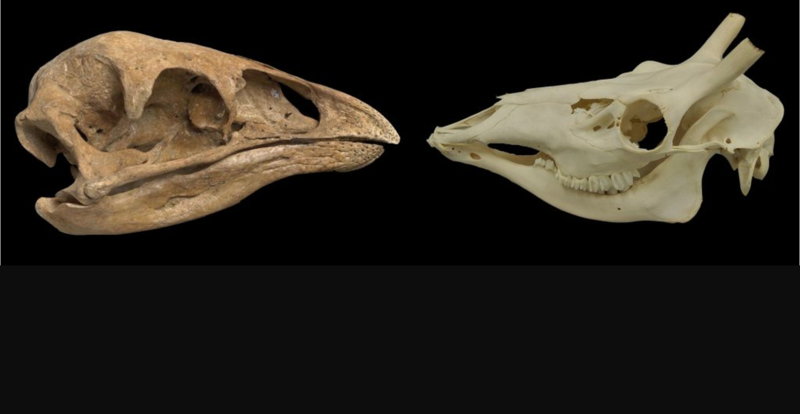 Look at a moa and deer skull, and other obvious differences crop up. 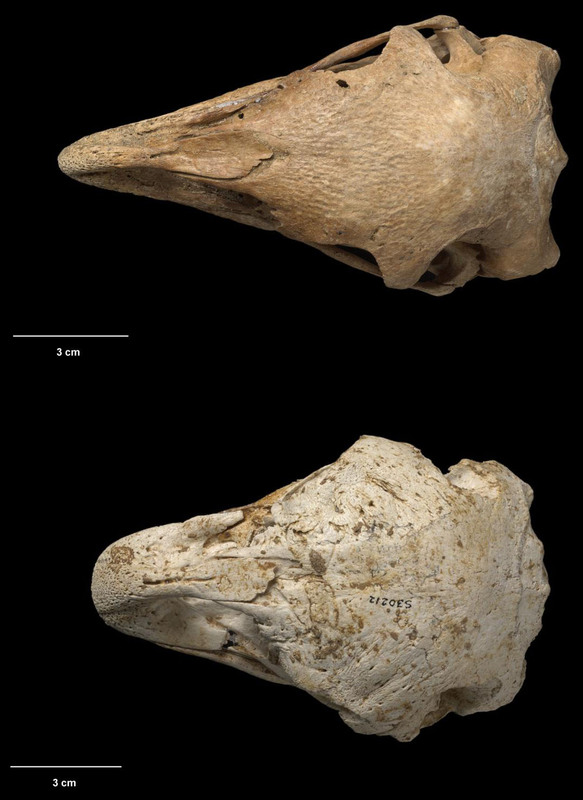 Deer have teeth and a prehensile tongue that can twist, and pull, leaves and twigs into the mouth, whereas the skulls and beaks of each moa species are uniquely shaped for cutting, allowing different species to minimise dietary competition. Moa skulls are so unique that not even other big birds like ostrich, rhea, emu or cassowary would get a job interview in the new world order. 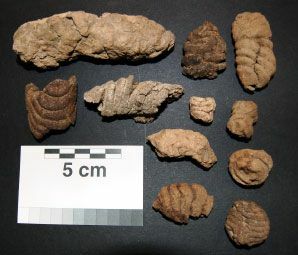 Rosetta stones of moa diet: It’s coprolites like these, found within ‘megafaunal latrines’ that hold the key to reconstructing lost ecological connections. Photo courtesy of Jamie Wood. 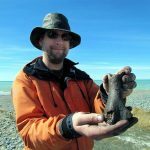 Moa coprolites, (preserved poo), which superficially look similar to a half-melted Cadbury Picnic bar, contain a biological treasure trove of dietary information including leaves, twigs, small seeds, pollen, and ancient DNA. These nuggets of ancient history are the final nail in the coffin of the feathers to fur theory. Moa had a significantly more diverse diet than deer, in the types of plants preferred by these big birds, including those with anti-browsing defences thought to have evolved in response to moa. Lancewood is a classic example. Once it reaches three meters in height, the limit giant moa could reach, this tree stops resembling an unhealthy dead individual and develops a bushy green canopy and starts flowering. Not only that, but moa were not able to disperse the fleshy fruits and large seeds of some of our iconic plants like miro and mataī. In a classic example of Kiwi scientific ingenuity involving a concrete mixer and acid to mimic a moa gizzard, Jo Carpenter and colleagues showed these seeds did not survive passage through the gut to germinate. Once thought to have evolved to be dispersed by moa, it now looks like these feathery giants were only capable of transporting small seeds. Some of the plants on the menu, capable of surviving in a world ruled by herbivorous birds, underwent a form of ecological release after the extinction of moa, only to be hammered when deer arrived on the scene. The Garibaldi Plateau in northwest Nelson is a perfect example of this differential browsing pressure. Coprolites from Euphrates Cave frequently contained small herbs that are now largely restricted to refugia inaccessible to deer, like steep rock outcrops or the walls of the numerous sinkholes that dot the plateau. The tools fit the bill: The different shapes of little bush moa (top) and stout-legged moa (bottom) skulls reflect their different diets. Photo courtesy of New Zealand Birds Online and Te Papa. Overall, the coprolites and skulls tell us that moa utilised a wide variety of habitats. Some species, like the little bush moa were forest specialists, while others, such as the heavy-footed moa, (think Cartman out of South Park), were open habitat specialists. The biggest moa of all, the South Island giant moa, was quite cosmopolitan. There is even evidence for migratory behaviour during different seasons in upland moa. Hot off the press in the last few years is evidence that moa, and other large herbivorous birds, may have played a key role in the dispersal of fungi and the spread of native forest. Alex Boast and colleagues recently found ancient DNA of brightly coloured mycorrhizal fungi, (a classic adaptation for bird dispersal), in moa coprolites. These fungi are key to the survival and spread of southern beech forest, that may now be curtailed in this post-extinction world. Remember those fresh steaming deer poo I was picking up with tweezers? Jamie used them to show that while deer eat both native and introduced mycorrhizal fungi, only those associated with invasive tree species, like wildling pines, survive passage through the deer gut and germinate. Time Lord science is illuminating not only the unintended consequences of introduced alien species to fragile ecosystems, but also that deer are promoting the spread of invaders that have never been present in New Zealand until recently. Moa were truly unique. No suite of feathery or furry pretenders could replace the broad range of feeding types exhibited by moa. Their extinction was a sucker punch to the way ecosystems worked in Aotearoa. Rather than deer being a case of ecosystem re-wilding, they are more a flight of fancy by people desperate to save their trophy heads and sport. The stage is also set for the full power of the ancient DNA revolution to illuminate a more nuanced picture of how moa functioned in the pre-human New Zealand ecosystem, as well as the consequent impacts of introduced deer and a detailed comparison of the diet of these heavy weights from the same sites. So now that we have thrown deer out with the bathwater, what do we do about this pest given the damage they do? Eradication is one possibility. Kiwis are an are an ingenious bunch, so I don’t envisage many issues here. If this is not possible, then serious consideration must be given to removing deer from all but the areas of least conservation concern. Better still, confine them to deer fenced country stations where people pay for the privilege of hunting these trophy animals, with the majority of revenue going back into conservation management and ecosystem restoration projects. Thank you for a great exposé of a hot current topic. You have provided me with a lot of valuable reading. Thanks. I hope the links to further reading are helpful. Let me know if you have any questions. Happy to answer. The oldest Moa fossil is ? ? Just 1.7 million years old. There is no proof Moa were in NZ longer than that is there? Haast eagle the predator of the moa shares a common ancestor with the two smallest Eagles still around today. It branched off sometime in the last 2 million years. Haast eagle fossils are mostly in the 10s of thousands of years old range. Further evidence that a moa ecosystem probably never existed for the long periods of time mentioned. Graeme Caughley had moa at higher densities than mentioned here. Similar to deer. 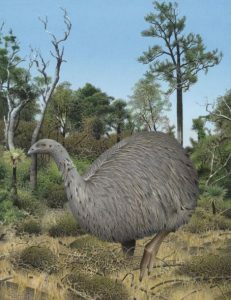 It is also believed moa migrated from the coast to the mountains in summer. This gave the forest fertiliser and respite from grazing. Deer would do something similar but the Contiguous habitat from winter to summer grounds is mostly no longer available. The bird economy is part of NZ history not it’s future. Deer are here to stay we just need to sort a suitable predator. The analysis of ancient DNA suggests the ancestors of moa arrived in New Zealand around 58 million years ago. The oldest moa fossils palaeontologists have found so far are 16-19 million years old from the Saint Bathans fauna in Central Otago. These Miocene moa were already giant and flightless. The “moa ecosystem” you mention has been present in New Zealand for tens of millions of years. Contrary to Graeme Caughley, the latest research suggests there were likely no more than 50,000-100,000 moa in New Zealand at the time of Polynesian arrival, and at much lower population densities than deer. While there is some evidence for seasonal altitudinal migration in upland moa, a sub-apline specialist, there is no evidence to date that moa migrated from the coast to the mountains in summer. The chances of finding a predator that will limit its hunting to deer and other feral pests is almost non-existent. Haast’s eagle was only in the South Island, so the “moa ecosystem” you mention would have been different in the North Island. The North Island form of Eyles’ Harrier may have preyed on smaller moa species but not the large ones. New Zealand has a good fossil record going back 60,000 years and patchy thereafter. That is the nature of the fossil record, (whether bones are preserved or not), in a geologically dynamic country. The presence or absence of predatory bird bones in the fossil record is not indicative of whether a “moa ecosystem” existed or not at any given time. Hunters should think about it this way: If ostriches, emus, cassowaries, rheas, and tinamous aren’t considered to be suitable replacements for dinornithiformes, then what chance do deer have? If we’re looking for a ‘more nuanced approach’, it seems unwise to characterise deerstalkers as ‘people desperate to save their trophy heads and sport’. Many, probably most, hunters are more interested in shooting for meat than antlers, and wild venison in Aotearoa is arguably the most ethically sourced meat available. I accept Nic’s contention that the impact of deer on our forest is very different and more destructive than that of moa, and also accept the necessity for more rigorous control and eventual extermination of deer from most, if not all, of our conservation estate. However, as a hunter, I’d like to point out that we ‘meat hunters’ are doing our bit to keep pest numbers down, and not only deer: many hunters, like me, are also engaged in trapping or poisoning of other pest animals and plants. Similarly, by no means are all hunters in the anti-1080 camp. I accept that when better means of eradicating deer are found, they should be used, but until then, hunting of one sort or another is what keeps deer numbers down, and DOC and other conservation minded organisations do the country a disservice by implicitly vilifying all hunters. I have little respect for trophy hunting, a sport that artificially selects against the very trait that it (so arbitrarily) values, but even trophy hunters help to keep deer numbers down. No longer using deer repellent in 1080 bait would be a good way to help control deer on the conservation estate. How hunters are characterised has no impact on ancient DNA providing a “more nuanced picture of how moa functioned in the pre-human New Zealand ecosystem, as well as the consequent impacts of introduced deer”. It is ironic that hunters often tout that they are conservationists, when the New Zealand Deerstalkers Association are more concerned with the numbers of deer ‘by-kill’ through 1080 use, opposing the DOC tahr cull, and pushing for the use of deer repellents to preserve herds during 1080 drops. Would it be possible that we, humans, are once again using rats, deer, stoats, possums and other “feral pests” as proxies for our less than positive impact on the planet?. It’s far more palatable to discuss how to control them rather than us isn’t it? My comment about a ‘nuanced approach’ referred to the value of nuance in general, and to attitudes to hunters in particular. Like many hunters, I DO claim to be a conservationist; I have no patience with the NZDA. I agree that targeting deer with 1080 would be more effective than hunting, but with the extreme anti-1080 sentiment prevailing, hunting seems a useful plan B. That said, even those most favouring 1080 admit that it is not at the high end of humane deaths, particularly for large animals, and finding a better method, poison or otherwise, would be desirable. I do not see hunting as that method: hunters are just as blameworthy for inhumane killing through non-lethal shots, so cannot take the moral high ground here. My point is, don’t throw the hunter baby out with the bathwater!